An example of people in a big city reducing their footprint, making the climate more comfortable and getting cheap and healthy food. Growing food in cities is quite common. It is estimated that about 800 million people grow vegetables and raise small animals in cities throughout the world (Smit et. al 1996). Cuba is the leader when it comes to growing food in urban areas. It’s prominence in this field has come about recently, as a result of its innovated response to external political and economic events. With the collapse of the Soviet Union in 1990, Cuba lost access to cheap fossil fuels, direct food imports, as well as pesticide and fertilizers, which it so heavily depended upon for its agricultural production. Cuba was not able to import food to feed its population or to continue with an agricultural system which needed imported fertilisers and pesticides. To solve the food problem they started developing urban agriculture. 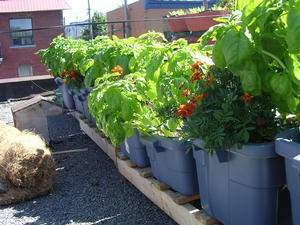 People were encouraged to learn how to grow food in infertile urban areas, using readily available and inexpensive materials. Over the course of time, growing food locally, using little or no inputs has become a general strategy. First the group planning to do this must look for places, which can be used to grow food. In addition to gardens, people can use balconies and roof tops, possible gardens that can be designed in schoolyards, unused public space, nearby hospitals, and medical centres. In Cuba people grow fruit trees (e.g. citrus, mango, guava, fig, coffee, bananas, avocado, grapes, etc. ), vegetables (e.g. various kinds of spinach, cucumber, tomatoes, lettuce, etc. ), ornamental plants (e.g. orchids, cactus, palms, etc. ), herbs (e.g. ginger, curcuma, oregano, rosemary, sage, basil, peppermint, etc.) and medicinal plants. They also raise small animals such as chickens, rabbits, guinea pigs, and ducks that are fed household waste. In Cuba there exists a central organisation promoting the permaculture, informing people, helping in the exchange of seeds, plants and information. They taught people about the optimal methods for growing a combination of edible and useful perennial plants, raising domestic animals and aquaculture. They introduced biological pest control and showed people how household waste could be treated and used as organic compost. They use frogs, insects, and small lizards as biological pest control. They raise guinea pigs, rabbits, pigs, and small birds. People are encouraged to collect rainwater; household water is reused after being treated with aquatic plants. • A way of using home made compost: the garbage problem can be much smaller if the organic garbage is being composted and used in the gardens. Any small open space can be used! Even if you have no space, you can grow vegetables in the city, a sunny wall is all you need! Growing vegetables, flowers or fodder for husbandry in urban and arid conditions can make good use of the space available along the outdoor walls of someone’s house. If in total 6 meters wall lengthwise would be used for 4 sets trays above each other, about 8 square meter would become available for this purpose. Collected waste water (quantity guess is 5 persons x 40 liters each = 200 liters daily available) could be used for watering the plants. Techniques could be applied as used in modern greenhouse agriculture, as done by the Israeli in the Negev dessert. The general setup has to make a small scale use of these greenhouse techniques possible. The work regarding controlling humidity, heat, nutrients, plant diseases and damage by insects can be done by people who stay home most of the time. To protect and control temperture and humidity the set of trays is covered by transparent plastic, hanging down in front of the trays. This plastic can be easily removed to give access to the plants. *) on this site you can find a lot of easy to make and sustainable designs to solve practical problems in a cheap way. Like the cloth pump, a water pump made from simple everyday materials, easily made even by nontechnical people! Why was the collapse of the Sovjet Union a catastrophe for the Cuban people? What is the main exported product of Cuba? What do you know of the relationship between Cuba and the USA? Untill 1990 Cuba received from the Sovjet Union mainly fossil fuels and pesticides. Perhaps it is environmentally a blessing that this stopped. Explain why. Cuban people grow the fruits and vegetables that fit in their climate. Which species would fit in your city if you would start growing food in your city? A city full of trees and gardens (even if they are small) is healthier to live in. How do trees and plant make the air cleaner? What is meant by ‘biological pest control’? Why is this more sustainable than chemical pest control? In the future more and more people will be living in bigger and bigger cities. This makes thje development of urban food gardening only more needed. Explain why this is a sustainable idea (give at least 3 arguments).